In June, Councillor For Hire brought me to Jabulani Vineyard & Winery on Jock Trail Road. This job wasn’t far off from one of my former careers as a bartender and server. Friday, June 22 was an absolutely beautiful day to work outside on the lovely patio at Jabulani. I had the pleasure of working side by side with co-owners Tom & Janet Moul serving samples of their fourteen different varieties of wine. The customers on this day were from as close as down the road and from as far away as British Columbia. 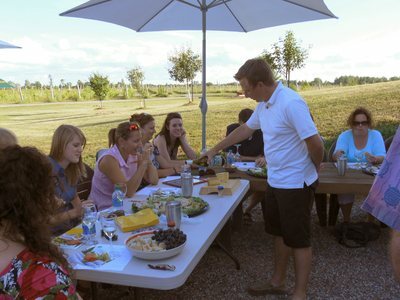 The day was capped off with a special group that came to experience all that the winery has to offer. The teachers of St. Phillip’s Catholic School in Richmond enjoyed a tour of the vineyard and samples of the great wine at Jabulani. To any parents out there who have kids that attend St. Phillip’s, the teachers came AFTER school and were quite well behaved the entire time. I first came across Janet & Tom’s piece of paradise in September 2010, several months before their grand opening. I’ve been a big supporter of what they have brought to Rideau-Goulbourn ever since. Having a winery in this area has brought a new kind of tourism to the communities of Richmond and Munster. The success of Jabulani has also spurred on others to contemplate the same type of operation. It’s not impossible that in ten years, there could be as many as five vineyards in this area. Bringing new business to our communities is key to sustaining our small businesses and wineries represent a clientele that may not currently be visiting this area. Not only are people coming to Jabulani, but Janet & Tom are encouraging visitors to buy other local products while they are out here as well. At Jabulani, you can find information about Hobbs Family Meats & Bakery, Anderson Farm, and Alpenblick Farm; all local farms that sell 100% local meats. Combine that with a visit to Richmond Bakery and you’ve got yourself quite the delicious, home grown meal. Rideau-Goulbourn has a lot to offer and Jabulani is a big part of that. If you’ve never been to Jabulani before, they are located at 8005 Jock Trail Road, just off Munster Road, west of Richmond. They are open from 11am-6pm Friday, Saturday & Sunday. Their fourteen different wines are made with grapes grown on site, such as Frontenac Gris and Marquette, which are then blended with Niagara grapes to create some great wines with local flavour. One unique product is their new strawberry wine, created with strawberries from Richmond Nursery. Thanks to Tom & Janet for inviting to spend a day as your employee. The Councillor For Hire series has been a great way to learn more about Rideau-Goulbourn, its businesses and its residents and I appreciate the opportunity to spend a day at Jabulani. For more information, please visit www.jabulani.ca. You can also now follow Jabulani on Twitter @Jabulani_Winery. Keeping with the theme of buying local, allow me to take this opportunity to introduce a new farmers' market to the area. The Manotick Farmers' Market at Watson’s Mill launched a couple of weeks ago and is a pilot that will run throughout the summer until the end of August. The Manotick Farmers' Market is located in Dickinson Square and runs on Saturday morning between 9am and 2pm. The North Gower Farmers' Market runs on Saturday mornings as well just off Roger Stevens Drive in North Gower. Take some time this weekend and visit both as your source for the best rural Ottawa has to offer. Looking for further updates on ward issues or just want to say hello? You can reach Scott at 613-580-2491 or by email at Scott.Moffatt@ottawa.ca. Be sure to follow Scott and Rideau-Goulbourn on Twitter and like our page on Facebook for regular updates about the ward and what's going on around the City.